I attended the recent Infinity Toy & Comics Show held just outside Orlando, Florida. One of their guests was my friend and Indie comics creator Richard Rivera from Stabbity Bunny. Of course, I was there to help him out. When I travel to different locations, one of the things I enjoy doing is checking out local comics shops. After all, many of the stores near where I live have often been picked clean. That’s often not the case in other places… especially where different kinds of fans from me live. After all, not everyone is big on Batman! Dealers, if they know what they believe their regular customers are interested in, and communicate with others in their line of work, especially in these Internet days. And when you get a number of exhibitors in the same room at a con, well, trading and buying/selling often commences! 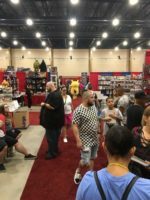 Many con attendees know that the best times to buy things at a con are just as the show opens (when folks want to kick off the con with a bang) or just before it ends (when dealers are trying to take as little back with them as possible). The rest of the time there are good deals to be found, but not as many as those opening and closing times. Also, some exhibitors are also collectors as well, so they roam the floor looking for what they want to take back with them. This con has been a good example of dealers working together. For instance, one dealer brought with him a collection of comics he had just bought. When another exhibitor saw it, he made an offer the other couldn’t refuse. Why? Because it had books he was looking for, that’s why! He couldn’t wait to get those boxes back to his store! Several artists traded some of their art pieces with each other. Hey, many are fans of each other’s work, too! Richard traded several hardcovers for something a dealer had he wanted as well. The barter system still works at cons – among exhibitors, anyway! As I previously mentioned, making sure your favorite shop owner knows what you want can make a big difference. However, not every owner doesn’t want to deal with this kind of stuff, or they may not exhibit at cons. If that’s the case, and you attend cons, look over the displays there. If you find someone selling the kind of thing you’re interested in, get their business card and/or email address. Many shops post their new merchandise out on Facebook, for example. That’s one good way to keep up with these folks. Also, if you develop a buyer/seller relationship with them, they’ll often look out for you as much as your local shop would. They want to make money, too! At the end of the con, several dealers made last-minutes transactions, helping make the con a good one for everyone involved. Dealers helped dealers, a behind-the-scenes process that can make a big difference and keep exhibitors selling the stuff you like to find at cons.